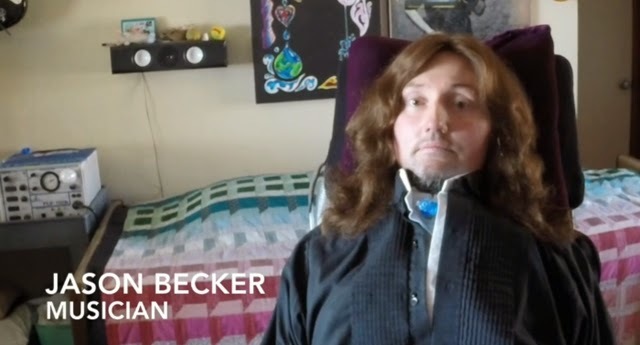 Former guitarist extraordinaire and current ALS victim, Jason Becker has challenged his former boss, David Lee Roth and Eddie Van Halen to an ice bucket challenge. The ice bucket challenge is currently a viral campaign to raise awareness on ALS. He has also announced a special benefit concert to combat Amyotrophic Lateral Sclerosis (ALS; Lou Gehrig's Disease). The Jason Becker: Not Dead Yet: 3 Music Festival will take place in San Francisco and will feature live guitar-driven music by extraordinary, internationally-known and iconic Blues, Hard Rock and Heavy Metal musicians Richie Kotzen (Winery Dogs, Poison, Mr. Big), Steve Hunter (Alice Cooper, Lou Reed, David Lee Roth), Michael Lee Frikins, Spiral Arms and Ben Woods, with special guests in an all-ages-welcome Benefit to End ALS, Saturday, August 30, 2014, at 8 pm at the Great American Music Hall. Proceeds will support the Jason Becker Special Needs Trust. In 1990, 20-year old guitarist extraordinaire Jason Becker, after already recording three full-length albums of his own and producing Richie Kotzen’s debut solo album, was selected to play guitar for David Lee Roth - a position previously held by two of the greatest guitarists ever; Steve Vai and Edward Van Halen. Jason went on to record DLR’s third solo album, A Little Ain’t Enough, released in April 1991, was voted Best New Talent by Guitar Magazine by April of the very same year, and was about to begin a world tour that would make him an international guitar superstar when Becker began to feel what he called a "lazy limp" in his left leg. Doctors who soon diagnosed him with Amyotrophic Lateral Sclerosis (ALS; Lou Gehrig's Disease) said, not only would never make music again, he wouldn’t live to see his 25th birthday. Over two decades later, now confined to a wheelchair and without the ability to move or speak, Jason – considered by many to be the ‘Stephen Hawking of music’ - is very much alive and making music. When: Saturday, August 30, 2014, Show at 8pm. (Doors at 7pm). Tickets: General Admission tickets are $26 and VIP tickets, which include dinner and admission, are $50.95.